STANFORD, CA - February 15, 2014: Stanford vs Rice at Klein Field, Sunken Diamond Stadium. Rice won 5-1. On the back of another stellar outing from its starting pitcher, this time from junior Brett Hanewich, Stanford baseball (3-1) picked up a 5-2 victory on the road against UC Davis (1-4) to continue its best start to a season since it opened its 2012 campaign with an eight-game winning streak. The bats also picked up behind big days at the plate from junior shortstop Tommy Edman, who tied a career-high with three hits, and sophomore left fielder Quinn Brodey, who drove in a career-high three runs. 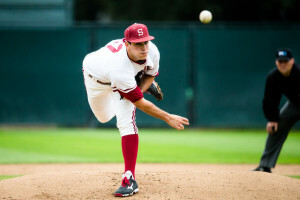 As a team, Stanford pounded out 11 hits, including six extra-base hits, to give Hanewich all the support he needed. Not that Hanewich needed the support. The right-hander, Stanford’s Friday night starter from a season ago, went 7.0 innings and didn’t allow an earned run, while scattering just three hits to earn the win. In a promising move for the veteran, he struck out four batters without issuing a walk, a vast improvement from last season, during which he struggled with his control (62 strikeouts to 49 walks). After allowing two hits in the first inning and working out of a jam, Hanewich retired 16 straight hitters in a dominant stretch from the second to the seventh innings before again largely getting out of trouble in the seventh to close his outing on a high note. Strong starting pitching has been key to the Cardinal’s success in the early goings of the season. In Stanford’s three wins during its 2016 campaign, its starters have combined for 19.1 innings in which they have allowed just one earned run while striking out eight and walking just one. Even in Stanford’s one loss, starter Andrew Summerville only struggled in one inning while maintaining a dominant form in the rest of his start, which bodes well for Stanford’s pitching depth moving forward, even in the absences of projected starters Cal Quantrill and John Hochstatter. After failing to find his groove at the plate during the Cardinal’s season-opening series against Cal State Fullerton, Edman finally broke out at Davis, notching a three-for-five day, including a triple to start the game, to regain his form as the table-setter atop the lineup that Stanford has come to rely on over the last two seasons. Edman gave the Cardinal a quick lead following his leadoff triple when he scored on Brodey’s sacrifice fly, before a solo home run from senior Jonny Locher – the third of his career – stretched Stanford’s lead to 2-0 in the fourth. The Cardinal proceeded to stay hot from the plate in the fifth, as a single from Edman was followed up by a pair of RBI doubles from Brodey and freshman Nico Hoerner to tack on two more runs and push Davis’s deficit to four. Another Brodey RBI double in the top of the seventh, again plating Edman, added another insurance run for good measure. Hoerner has been one of the pleasant surprises for Stanford to open the season, as the freshman has brought consistent defense and some great at-bats at the plate to the second base position, which was a source of some uncertainty going into the year. He is one of only five players to have started all four games and is tied for second on the team with his four hits. Although sophomore reliever Keith Weisenberg struggled with his control and was responsible for a late Davis run in the eighth, a clean ninth inning from freshman Kris Bubic in his collegiate debut sealed the victory for Stanford. Stanford will depart for Austin, Texas today to prepare for a four-game set against the No. 23 Longhorns (2-1) from Thursday to Sunday for a stiff road test. Freshman Tristan Beck will likely take the mound for Stanford on Thursday to kick off the series, seeking his second win of the season. Contact Do-Hyoung Park at dhpark@stanford.edu.